Husband. Husband, husband, husband, husband, husband... why for would these words ever come out of your mouth, "Oh yeah, you won something from some magazine while you were gone... there was some hand-written letter stuck inside it... something about 2nd place... would be getting a check in the mail... I dunno... some sort of hors d'oeuvre..."? and then NOT be able to produce the ferkin magazine or anything that came with it!!! Well, don’t tell ME I won something and think I’m not going to sniff it out! I’m hoping I’m right about this being a 2nd place winner (I’m pretty sure even Husband couldn't make that up). I haven’t actually laid eyes on the magazine but I see that this recipe I submitted has been published online with a photograph and is now listed as a “contest winner” on the Healthy Cooking magazine website. I'll let you know if I'm wrong about the 2nd place thing but this is definitely my recipe. I love, love, LOVE this appetizer. Mostly because I love horseradish and blue cheese but also because it’s one of the easiest hors d'oeuvres on the planet to assemble and you will look like a total rock star when you serve it. Cut baguette into slices (about 1/3 inch thick) and lay out on a cookie sheet. Drizzle slices with olive oil and sprinkle with salt and pepper. Bake at 400 degrees for 6-8 minutes or until bread slices start to toast on the bottom. While bread is toasting, mix sour cream, horseradish, chives and salt and set aside. Remove bread slices from oven and arrange roast beef slices on top. 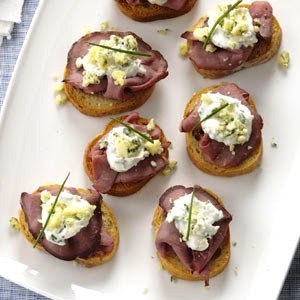 Top with horseradish cream then sprinkle each crostini with blue cheese. Garnish with additional chopped chives. 1 appetizer equals 48 calories, 1 g fat (1 g saturated fat), 11 mg cholesterol, 176 mg sodium, 5 g carbohydrate, trace fiber, 4 g protein. I plan to make this for a party next week. Do you bring the roast beef to room temp or serve it cold? Thanks!! I start with it straight out of the fridge and it comes to room temperature pretty quickly. Cold or room temp is fine (to me anyway! ).